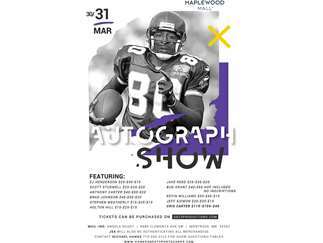 There will be a large and diverse Sports Memorabilia And Football Autograph Show at the Maplewood Mall in North St Paul. Show runs full mall hours Friday/Saturday/Sunday in the upper ring near the food court! Over 40 tables of new and vintage sports cards, sports wax, entertainment wax, autographed sports memorabilia, collector supplies. Dealers from throughout the Midwest will be Buying/Selling/Trading/Appraising. Plus numerous Minnesota Vikings will be signing autographs all weekend!! Including Cris Carter, Anthony Carter, Scott Studwell, Bud Grant, plus many more.